Papua New Guinea reached 50-1 at stumps on day three as they chased 346 to beat Ireland in the Intercontinental Cup. After bowling out the South Pacific nation for 188, Ireland declared on 244-5 to set a very tough victory target for their opponents. Tim Murtagh dismissed Lega Siaka to put Papua New Guinea on 19-1 but there were no further wickets before the close. Kevin O'Brien was 75 not out with Andy McBrine unbeaten on 40 as Ireland declared; Ed Joyce having hit 58. Joyce's run out by Norman Vanua in the 41st over left Ireland on 129-5 but O'Brien and McBrine then produced a 115-run partnership. Assad Vala, after hitting 120 in Papua New Guinea's first innings, remained at the crease on 17 not out at the close on the penultimate day, with Vani Morea unbeaten on 18. Ireland are the Intercontinental Cup holders, and retaining the trophy would mean they qualify for a play-off for Test status. They began the match sitting second in the Intercontinental Cup table, six points behind Netherlands, after winning their two opening fixtures. Ireland secured the six points on offer for the first-innings lead, after taking the last three wickets for 22 with Vala last man out for 120. Murtagh claimed the final wicket to finish with 4-33 with Boyd Rankin (3-21) taking three wickets on his return to Ireland duty. 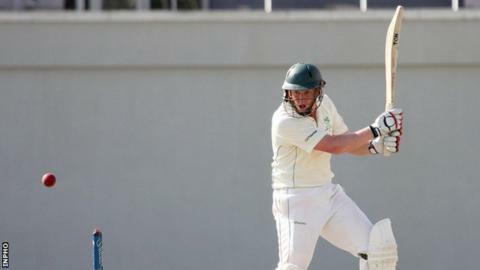 Captain William Porterfield, Paul Stirling and Niall O'Brien departed cheaply in Ireland's second innings before a partnership of 76 between Joyce and Gary Wilson brought stability. The final day starts with all results still possible but Ireland will be favourites to claim the nine wickets needed to secure the full 20 points on offer. However, the Irish will be wary of the hosts' ability to chase down a total as Vala's unbeaten 124 helped them in a successful pursuit of 305 against the Netherlands last summer.